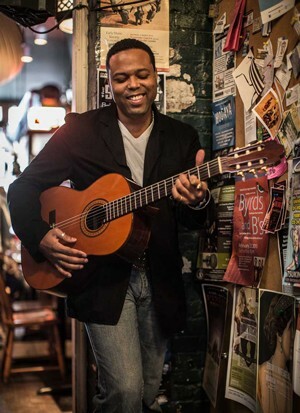 Born into a musical family in Cuba, Adonis Puentes began playing guitar at the age of 6. By the time he was 14, the virtuoso was singing and writing his own music. Nominated for a Juno Award and a Latin Grammy, the singer/songwriter became a great Cuban Sonero very early in life. Sonero is the top honor for a Latin performer and one that Puentes holds dear to his heart. “I’m a messenger of my Cuban heritage and tradition,” says Puentes, who has traveled to Cuba many times to cultivate those roots. He describes his music as “fusion with Cuban roots.” This is a deep and abiding heritage, he says, especially the síncopa—that fusion between the African and Spanish cultures. His 2014 album Sabor A Café certainly exudes a Latin flavor with a hint of Afro jazz. Each song reaches the soul with lyrics about heartbreak, forgiveness and even love that endures. During a performance, you will find it difficult to sit still as these original compositions and rhythms lure you to your feet. With his goal to bridge generations and culture, Adonis Puentes and the Voice of Cuba Orchestra is one performance you won’t want to miss. They will perform at the Rialto Theater on Friday, Jan. 30, 2015, at 7:30 p.m. For ticket information, visit broadwaycenter.org.